I feel like this question has been asked before, but I couldn't find it. I think I am missing something obvious. Basically I am going to have a DataGridView with two columns. One textbox, one combobox. The textbox column is going to be coming from a database (actually I could manually create it if i had to). It makes about 20 rows, each with a unique value for the textbox column. So for each entry, you can pick a value from a combox, pretty simple, that part works. Now what I want is, based on some criteria, that a certain value in the combobox field be "selected" by start, instead of an empty box. I am roughly going to take a particular string, and if its a choice in the combobox, select it. If it is NOT a choice, select the first item in the combobox. I cannot seem to set the combobox value. With a regular combobox, there is a .Contains on the items (items is always empty when using a datasource) and then is has a .SelectedItem property. The Selected whatever properties aren't on thse DataGridViewComboBox cells. I have tried just setting the .Value property of the cell, which correctly triggers the DataError event if it's not a choice, but then the value cannot be re-set based on that? GridView: how to hide/show controls based on a value in another cell? How would you design this Windows form? 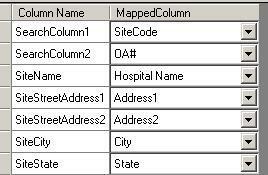 How do I format certain DataRows of a Windows.Forms.DataGrid?